What is Interstitial Cystitis/Painful Bladder Syndrome? Interstitial cystitis (IC) is a condition resulting in recurring discomfort or pain in the bladder and the surrounding pelvic region. Its cause is unknown, but is believed to result from a chronic inflammation and degeneration of the bladder wall. It may be more appropriate to call IC “painful Bladder Syndrome” (PBS). IC/PBS has become a significant health problem due to its chronic debilitating character. It’s not clear what causes interstitial cystitis, however, one theory suggests that one of the protective layers of the bladder wall may “leak” in people with interstitial cystitis, allowing chemicals in the urine to irritate the bladder. It may be associated with other conditions, such as irritable bowel syndrome, endometriosis and fibromyalgia, as many women with interstitial cystitis also have these conditions. People who have interstitial cystitis often have small areas of scarring, stiffness or bleeding on the wall of their bladder. Around 5-10% of people with interstitial cystitis have patches of inflammation and broken skin in the bladder, which leads to more severe symptoms. These are known as Hunner’s ulcers. There are an estimated four hundred thousand people in the UK with IC/PB, of whom, 90% are women and 10% are men. People of any age may be affected, including children, but two thirds are thought to be between 20 and 50 years of age. IC/PBS can affect anyone from any background. Lifestyle adjustment and fluid management. Bladder distension (where the bladder is filled with water to increase its volume). GAG is a combination of Hyaluronic acid and Chondroitin (IAluRil®). Injection is a clear, colourless liquid for use in the temporary replacement of the bladder lining.The primary component is sodium hyaluronate, a salt of hyaluronic acid,which occurs naturally in the fluids of the eye, the joints, and in the glycosaminoglycan (GAG) layer of the bladder lining.This layer which is deficient in many patients with interstitial cystitis, and other painful bladder conditions is believed to provide the bladder wall with a protective coating against irritant in the urine. 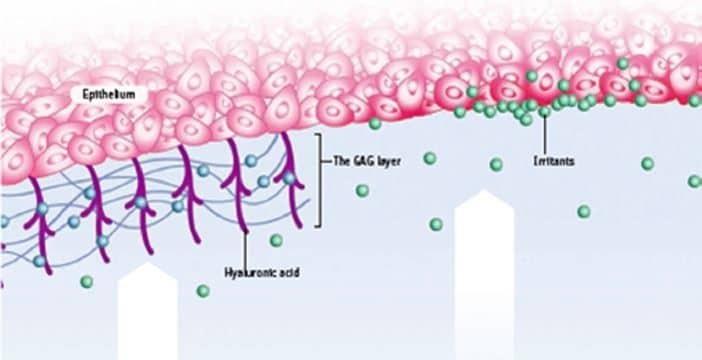 How is Glycoaminoglycan (GAG – IAluRil®) administered? IAluRil® is instilled directly into the bladder. The procedure is quite painless and may be undertaken in a hospital/clinic, or self-administered following instruction from a Health Care Professional. For best results, Hyaluronic Acid should be retained in the bladder for as long as possible (a minimum of 30 minutes).